Our home food fest is always a busy time for us here at Black Welsh Lamb and if you missed the festival you can share some of it with us. This year we were really delighted to support Belazu with their #cookforSyria meal, where Anna Hansen cooked hogget legs and shoulders to an appreciative audience of 60 people across two sittings. Saturda y saw our third annual sheep tasting – this year we were delighted to have the combination of Jane Baxter cooking four pasture-fed mutton samples and Cyrus Todiwala discussing the benefits of mutton with a packed room of willing tasters. People are genuinely blown away by how tender and tasty mutton can be if it is reared well and hung in decent conditions for three or four weeks. Abergavenny is a great place to catch up with people as well. We bumped into Sam and Shauna from the Hang Fire Smokehouse, whose series featuring our lamb and the farm is being reshown on BBC network at the moment. We also got the chance to congratulate the amazing Gareth Ward of Ynyshir who has just been voted UK chef of the year by the Good Food Guide. As well as being an amazing chef (dinner at Ynyshir is 19 courses), he is a great fan of our lamb – recently tweeting “this takes lamb to the next level”. You can experience this game-changing meat in the comfort of your own home. We currently have hogget ready for delivery – either whole or half and butchered to your requirements. We have also been approved to sell frozen from the farm (gaining five stars for our hygiene rating) and always have a range of cuts in stock, along with our brilliant gourmet burgers. Just give us a ring or e-mail for details. In the twenty years that we have been at Pen y Wyrlod we have been through waves of activity; developing the flock (both human and the sheep), careers and businesses, restoring the buildings, creating tourism spaces and developing relationships with some amazing chefs across the country. This year we felt we wanted to go beyond that and bring people to the farm to grow ideas. We set out to gather 15 people and one dog for some conversations and stories, but ended up with many more. The concept was to link global thinkers and local activists together, to forge new relationships, spark ideas and seed radical projects. We were blown away by the response we received, with so many lovely people travelling from near and far to a simple space in a barn in North Monmouthshire. We had amazing insights and stories from so many people – the first day kicked off with the amazing Robert Penn; speaking of bicycles, trees, wheat and bread; Rob Yorke made the case for entering the conversation without badges or baggage, then a trip to Robb Merchant at Whitecastle Vineyard to hear how a maverick vision became an award-winning reality in a few short years. We sat transfixed as Daniel Morden weaved complex tales drawn from the near-forgotten traditions of upland travellers; of witches and magic leaves and ancient Welsh heroes. We had cool sounds from Tom Carter to fuel the conversation over beers and street food. We slept for a few hours, rising to Ashtanga yoga with Alex Hedges followed by a back to back of farm stories from Sarah Dickins and me about our reasons for taking on a small farm in this beautiful part of Wales and my obsession with soil. Our lovely neighbour Huw Evans described his huge ambition to grow Three Pools into the largest permaculture farm in the UK whilst bringing people on the journey through events, environment and music. Andy Middleton, inspiring and entertaining as ever, shared his vision for optimising the food chain in Monmouthshire and the possibilities open to Wales as a result of the Future Generations Act. We moved seamlessly into Sammi Jones of Wright’s Food Emporium talking about her work with Simon Wright to develop greater literacy about understanding and using artisan foods in hospitality and education. We hope to be working with Andy and Sammi on these projects and are really excited about the potential for re-localising and driving change back through the food chain. A late lunch and then to France for Charlotte Southall introducing her pioneering work on tapping into natural resonances of plants to boost growth and resistance to drought. Mark Lloyd took us through a real call to action on soil erosion and the impacts of poor framing practice on rivers, fish and ultimately our ability to produce food in the future. We were then taken on a moving journey around marginalisation and the reality of climate change for one small community in rural Wales. Fairbourne is the first village in Wales to be officially given up to the sea, with a strategic decision to no longer fund flood defences. Ruth Tudor is embarking on a long-term, immersive study of the human scale effects of living in a condemned community and the challenges of grieving without a fixed end date, anyone to blame or a point of closure. The afternoon came to close with a meditation of thanks to the farm and “Grandfather Stone” from Jurjen Rolf – restoring our connection to the earth and finally bringing the sun out from behind the thick layer of perma-cloud for a tour of the farm whilst multi-talented Mark Lloyd sparked up the barbecue – doing full justice to some Black Welsh Lamb. As dusk fell, the bar filled up and local band the Ironics played long into the night. Conversations flowed and we crawled into bed around 3.30am after an inspiring day. I was up again at 7.30 to prepare mountain bikes for an outing to Whitecastle with Gideon Mogendorff Jurjen Rolf and Jonny Miller – riding up hills and down muddy tracks was a great way to clear the inevitable fuzzy head from the night before. The final morning was an inspiration, as Jonny Miller took us through his experiences of free diving, the links to meditation and learning to give way. Gideon Mogendorff brought things to a gentle close with a beautiful meditation around our ancestors; a fitting tribute to the ancient setting. Sarah and I would like to really thank everyone who took part, those who wanted to and couldn’t make it (especially Lynn Zebeda who was prevented at the last minute by poor Manoa being so ill) and everyone who helped to make it happen. A special mention to Turki al Saud and Nora for travelling halfway across the world to a small farm in Wales. It was a truly inspiring weekend and will rest with us for a long time to come. Earth Summit is over; the barn is empty, the pub quiet and holding a faint memory of darts in the dark and stilt walking for beginners. We just wanted to express our profound thanks to all who came and made this happen; from far and near. The sun let us down, but the rain brought a closeness and sense of the collective as we pretended to be warm enough in the ancient barn. Would we do it again? Watch this space! So – election time again and we’ve got a few things to say. If sheep could vote (which they still can’t despite years of campaigning for eweniversal suffrage) things could really change. For a start, we need more wooly thinking: It’s time we saw a fair price for our hard-grown locks. We’ve been fleeced by successive governments and there is no sign of a change. We demand action to fight off competition from unsustainable, oil-based products and put wool back on all our backs. Next; Universal tagging for all species. We enjoy full traceability by being individually tagged from birth and even have our own unique QR code, so you know exactly where we have been. Even dogs have microchips these days, so time you humans caught up. Sorting out the Nation’s food. We only eat grass and hay off the farm; we know exactly where it comes from and what goes into it. So should everyone, so eat Pasture-Fed for a better life. Saving the NHS. We are fully organic, so would only ever see an antibiotic or chemical medicine if it was a matter of life or death. Too many sheep (and people) get fed antibiotics like smarties; no wonder they don’t work anymore. Finally, the environment. We pasture-fed sheep have much lower emissions than most and our farms have a tiny carbon footprint. So to be green, vote pasture-fed. When the weather is as lovely as its been this month it is the best time here at Pen y Wyrlod Farm. We’ve been lambing for three weeks and now nearly a hundred little black lambs are racing around the fields as their mothers bleat for them to return. Our lambs are mainly born outside but some years we have to take them into the old stone barn for a night or two if it’s cold and wet. This year the weather has been so kind they have all been able to be outside – starting their life on our organic ancient pasture. It’s not just happy lambs that have been making us feel good about life. We’ve welcomed back the first of the swallows that flew off to Africa as the autumn came. And for the first time we have ducklings! We found this nest with 11 eggs on the edge of one of our ponds, but four days later the eggs disappeared and we thought the mother had been chased off. But this week she turned up – with a whole bunch of unfeasible cute ducklings swimming along behind her…….. But the dawn chorus, the swallows and the ducklings are merely a happy distraction . The really important arrival this April has been lots of fresh, lush grass for our sheep to eat. And that’s why our lamb is so special; ancient pastures, organically nurtured and rare breed sheep allowed to grow as nature intended. The result is fantastic tasting lean lamb, hogget and mutton with the goodness of nature passed on to you! 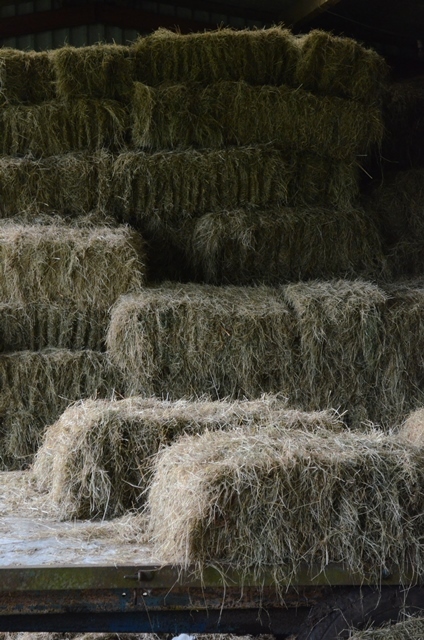 Down here at Black Welsh Lamb we are relieved to have a barn full of hay to see us through the winter. Being grass-fed means that we have to rely more than most people on a good store, as we can’t fall back on cereal-based feeds if the hay runs out. Haymaking; a hugely romantic, traditional aspect of farming is one of the most stressful times of the year for us. Our participation in the Glas Tir environmental scheme means that we cannot cut grass until after the 15th July, which as any parent knows, is when school holidays start and good weather ends. Sometimes we can take advantage of young farmers’ need for cash the week before the Royal Welsh Show to get our permanent hay meadow contract mowed, turned and baled before the rain sets in. This year, however, the RWS dates meant that it didn’t happen, but neither did the rain and we finally cut in the first week of August. It takes three or four days of decent sun to make really good hay and so the combination of good weather, perfect grass and decent availability of kit and labour is vital to getting things right. The idea of making good hay is that it bottles up sunshine to bring out in the winter. Any rain on it will grey out the sun and make the crop dull and lifeless. However, no matter how carefully you choose your week to make hay, there is an unwritten rule that the weather forecast will change about ten minutes after the grass is cut. We had a guaranteed week of sun this year, but as the mowers left, the clouds gathered and the threat of rain grew real. A few spots here and there, but the clouds subsided and we moved back into glorious sun. After a couple of sleepless nights, our beardy neighbour Tom rowed up and baled 350 bales of the best hay we have ever made. A few hours later we had it in the barn, where it rests, gently putting out a glorious hay smell and sitting ready for the winter to come. The sheep haven’t noticed yet, as we have plenty of nice late summer grass to concentrate on (and the odd thistle), but soon they will welcome it as a reminder of when days were long and and the sun shone bright. For us, the hay is a passport to making sure we can offer the finest pasture-fed lamb and hogget for our loyal customers. Without it, life would be dull indeed. So here’s to a barn full of the finest and a successful winter ahead. Our hoggets are available to order from the end of August. We supply whole of half sheep and the average weight is around 15-20Kg (including bones). We can deliver anywhere. Drop us a line at baa@blackwelshlamb.com to enquire. 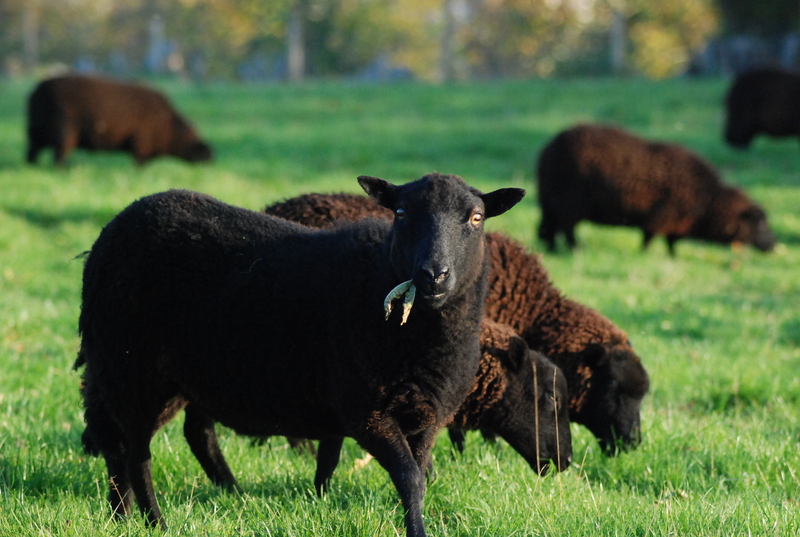 So what’s so special about Black Welsh Lamb? We are often asked what it is that makes our lamb so special, or at least different to other products. To be honest, it is hard to know where to start: We aim to produce the tastiest, most tender, natural meat by the most sustainable means and with the least impact on the World. That sounds like quite a challenge, so how do we go about it? We are organic. It is a common assumption most sheep are “just about organic”, but this is sadly far from the case. Our Soil Assocation organic licence is rigorously audited each year to ensure that we use no routine antibiotics or medicines (in fact we used no antibiotics at all last year), no feeds or mineral supplements with any gmo ingredients and that we maintain the highest standards of animal welfare at all times. We are not allowed to apply any chemical fertilisers or herbicides on the land and we have to work to a plan for developing long-term fertility rather than farming the top two inches of our soil. Whilst this is all a challenge, we have been here long enough to understand our fields and our sheep sufficiently to work with them to meet these standards and we are firm believers that Soil Association organic is a trusted brand for our clients. We are pasture fed. Again it would be fair to assume that sheep eat grass – but whilst they do, many sheep are also fed lots of other stuff including imported, grain-based concentrates with added soya, ammonium chloride, copper inhibitor and vitamin E. Our sheep eat grass and hay from the farm, full stop. We can do this because all our land consists of traditional mixed pasture, with many different varieties of grass and herbs to provide a balanced diet for our stock. Pasture fed lamb has a number of other advantages; fewer food miles, leaner, tastier meat, greatly reduced carbon footprint and suitability for specialist diets such as Paleo. There are lots of claims made about grass-fed meat, but only a select few farms are accredited by the Pasture Fed Livestck Association, who set the benchmark for pasture-fed meat. We are one of only three farms in Wales to be PFLA accredited and we are proud to have met their rigorous standards. Our choice of sheep. 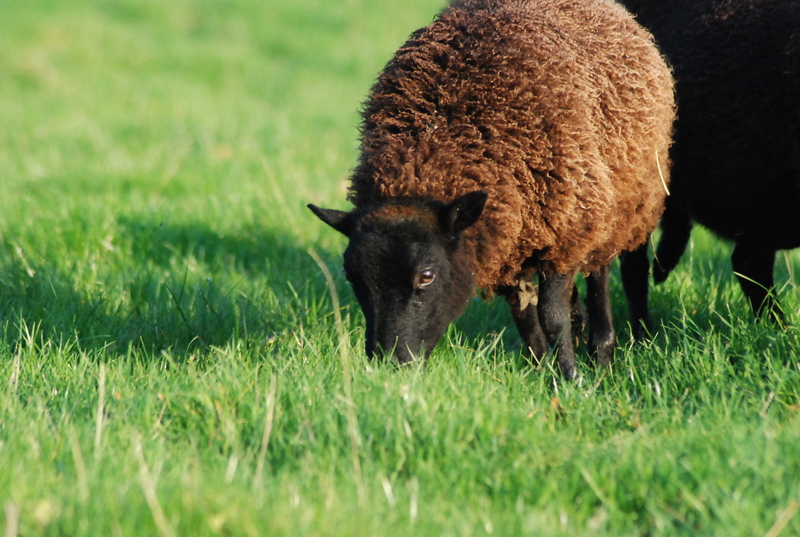 We farm pedigree Black Welsh Mountain sheep – a traditional breed that suits the upland grass of our farm. We have a closed flock of more than 300 sheep that we have bred from a starter flock of just six over a period of fifteen years. This means that our lambs are closely matched to our grass and can make the best use of it throughout the year. Black Welsh Mountain sheep are renowned for their lean and tender meat and we build on this by maturing them slowly for at least 15 months, as opposed to 15 weeks for mainstream commercial lambs, selling them as hogget lambs. This longer maturation period allows the meat to develop more complexity of flavour, whilst retaining its texture and tenderness and without building the excess fat that comes from feeding cereal-based supplements. Focusing on the soil. We believe that healthy soils make for healthy food and so are very careful to build fertility and resilience in our soil. This means no ploughing (most of our fields have not been ploughed for more than a hundred years), maintaining a balance of mixed grasses, clover and herbs, minimising tractor use and encouraging wildlife by looking after our hedges and field margins. All this helps to reduce compaction and allow air into the soil, which boosts growth and allow the grass to take up micro-nutrients from the soil more efficiently. Critically, it also helps build our earthworm populations; allowing worms to take dead leaves and organic matter from the surface and replacing it with mineral rich worm casts. Worms are incredible animals, living for up to ten years in permanent burrows and forming a vital part of our ecosystem. You may be surprised to know that in a healthy field of cows, the weight of earthworms beneath the soil should be greater than the weight of the cows grazing the grass! Careful processing by excellent partners. We have learnt from experience that it is no good producing the finest lambs, only to see them devalued by poor processing. We are delighted to work with the organically approved abbatoir facilities at Bromhalls of Stonehose and the excellent hanging and butchery at Model Farm, Ross on Wye. Our hogget lambs are hung for a minimum of two weeks prior to being butchered and so it is critical that they are kept in the right conditions. Many butchers struggle to keep hanging spaces dry enough, as they are continually opening cold room doors, allowing moisture to enter. Model Farm is a low volume processor providing perfectly controlled conditions for gently ageing the meat and the results reflect this. Our customers. The final link in the chain is the customer and we are very fortunate to work with some excellent chefs and private individuals who really value what we do, as well as enjoying the unique taste of our lamb. We only sell direct, as we want to maintain the connection between producer and end user. We hope that you will enjoy our lamb and trust that you will agree that our approach has really brought results. 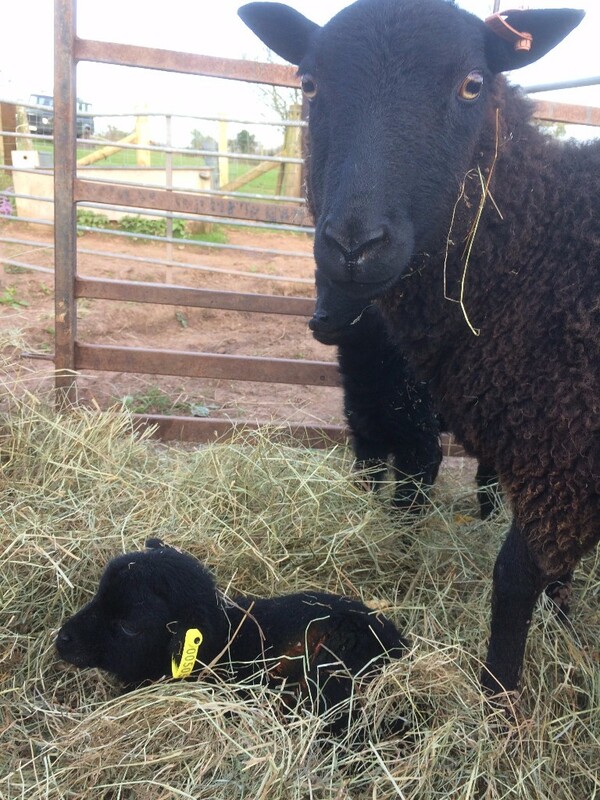 We want Black Welsh Lamb to be the best meat you have ever tasted, as well as being part of a positive approach to the environment. This is a recipe from our French friend Caroline, who writes…. 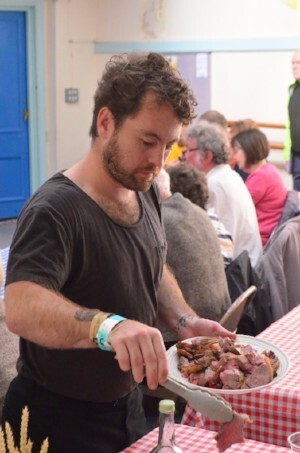 “As promised, I’m coming back to you with a recipe using the beautiful lamb shoulder you offered us to taste, when we met you end of september just off the Offa’s Dyke, by your farm. I made a simple stew on a slow cooker, and thickened the stock with a roux just like you do a blanquette. Place the diced shoulder in a pot and cover with cold water, bring to the boil, keep simmering for 10 minutes and with a ladle skim the surface from the impurities foaming. Remove the pieces of meat, pass the liquid through a fine mesh sieve and let it cool. While it’s cooling, prepare your veg, wash, peel and slice or dice them. Separate leaves and stalks of the parsley, peel and cut in 2 the onion, pick it with the cloves, peel and cut the garlic cloves in 2. Place the meat, the veg and aromates (leaving the parsley stalk for the last 15 minutes to save the vitamins) in the rinsed pot, cover with the stock, bring to the boil and leave to cook for few hours (about 2) on a slow cooker, barely simmering,and checking meat and veg regularly, add the lentils or barley 45 minutes before the end. If you use lentils, only add the salt at the end of the cooking or they will explode. Earlier when using using barley. Melt the butter in a small pan, add the flour and cook it few minutes without browning. Strain half a litre of the cooking liquor, and add it in few times to the flour mix, stirring with a whisk, and cook it few minutes, add salt and pepper, then the cream if you wish. Pour this white cream over the meat and veg with the remaining liquid if you want a fluid stew type liquid, or strained for a richer finish. Scatter the chopped parsley like green confetti over for a good dose of vitamine C!